Posted November 8, 2018 at 8:07 am . 1 comment. 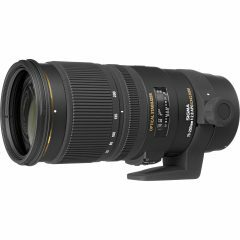 B&H Photo Video has a number of excellent pre-holiday deals! They have the Sigma 70-200mm F2.8 EX DG OS HSM for Canon plus a free Sigma 1.4x Extender for $1149.00. The lens is regularly $1399 and the extender is regularly $199, so this is a $450 savings! B&H Photo Video is also discounting the Adobe Creative Cloud Photography Plan with 1TB Cloud Storage (12 Month Subscription, Download). It’s now $179.88 — discounted $60 from the regular price of $240. This is the ‘upgraded’ version of Creative Cloud Photography plan, which comes with 1TB of cloud storage (rather than the usual 20GB). Finally, they have a sale on the Samsung 32GB EVO+ UHS-I microSDHC Memory Card with SD Adapter for $9.99. Save $12 on this UHS-I microSD card that is rated up to 95 MB/s read and a minimum of 10 MB/s write. This is the several-years-old Sigma model, is it not? I don’t seem to recall this lens being very competitive versus the Tamron (G1 or G2).